Making our costumes last Halloween got me back into the idea of sewing. Now, it’s not the action of sewing itself that I like. In fact, it’s a time-consuming drag sometimes. However, I get ideas in my head and I like getting them out of my head. Since I’m not famous like Kanye West, billionaires are not going to give me money to bring my beautiful ideas into the world. Therefore, I’ve got to do the plebeian sewing myself. 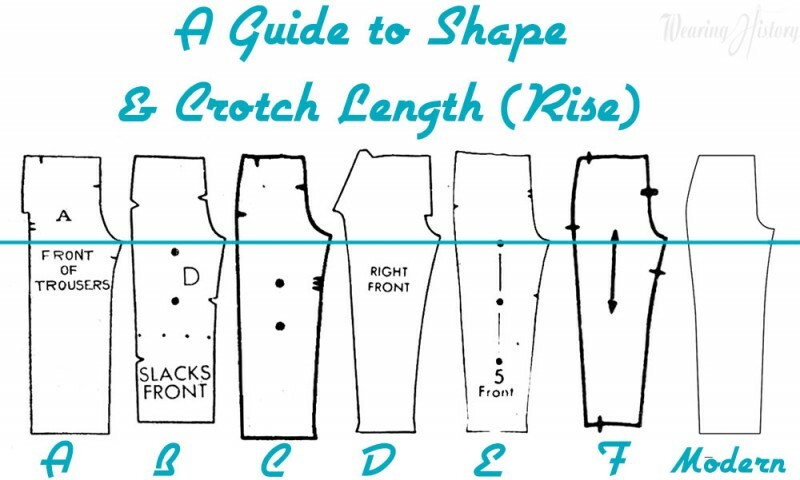 Recently I came across the Steely Seamstress’s blog. She says, “I’ve just been drawn to various projects either because I like the pattern or fabric or because I feel that the techniques I’ll use in the project are ones that I can do. I have tried to challenge myself incrementally; I don’t want to try to run before I can walk.” Oh, no! I’ve just been taking the scissors and running with them! I keep thinking that I should sew a few simple things and build up my skills, but the real reason I want to sew is to make the things I imagine in my head. I’ve been bookmarking some things that I found inspirational. Then it occurred to me, that websites don’t last for ever, and it’s going to take some time for me to actually make the stuff. So, it occurred to me that I should copy to my hard drive (keeping in my own grubby little paws, not in the cloud) some of the things that have really struck me and I feel like I’ll want to see again. Indeed, I went back and one of the sites I had been looking at seems to be down. 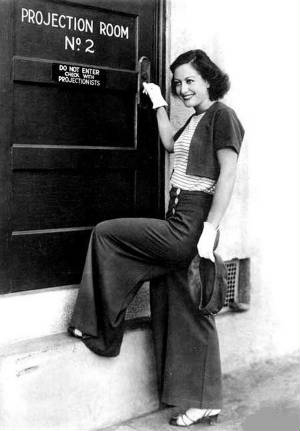 It was a Tumblr site called “Giant Pants of the ’30s,” or something like that. 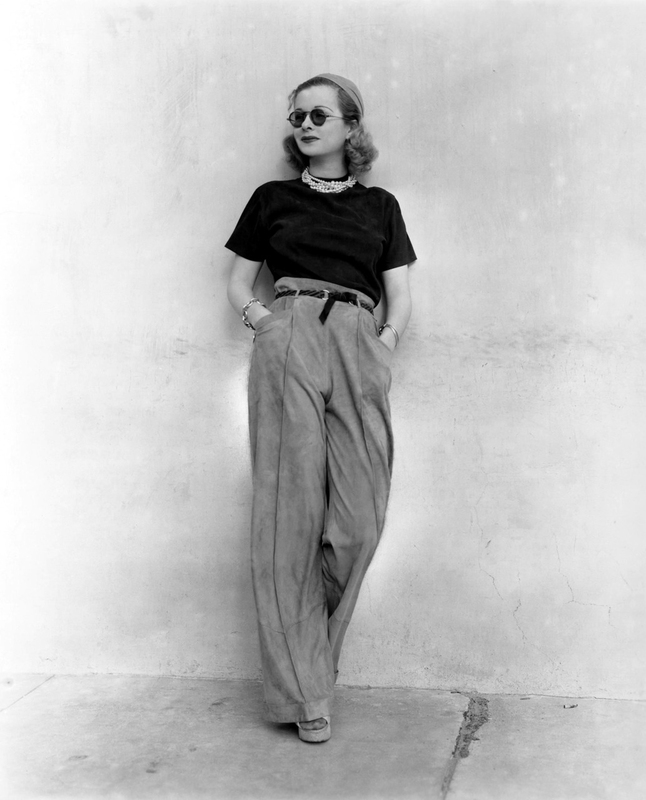 Somehow, I had a hunch that a blog devoted to great big trousers from one decade in the twentieth century would not last forever. I came across it by accident a couple of years ago and thought, “These things look great.” Although that site seems to no longer be accessible, that person, or someone else, seems to have migrated some of her pictures to one of those photo sharing sites. So, I took the liberty of copying some of the pictures. Mainly I intend them for my own use, but since they look so great I thought I’d share some of them with you. Enter the 1920’s and the “flapper”. Pajamas are all the rage- in the boudoir and by the seaside. 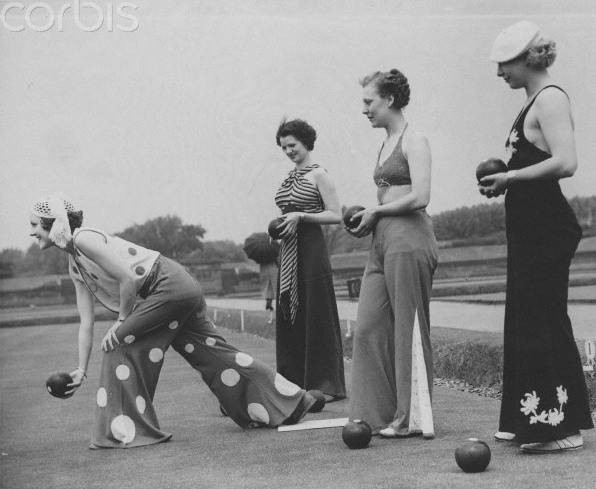 Some daring women even started wearing men’s trousers. Was it accepted by the majority? Definitely not. But they started gaining in popularity thanks to the seaside, the boudoir, and the new collegiate co-eds! 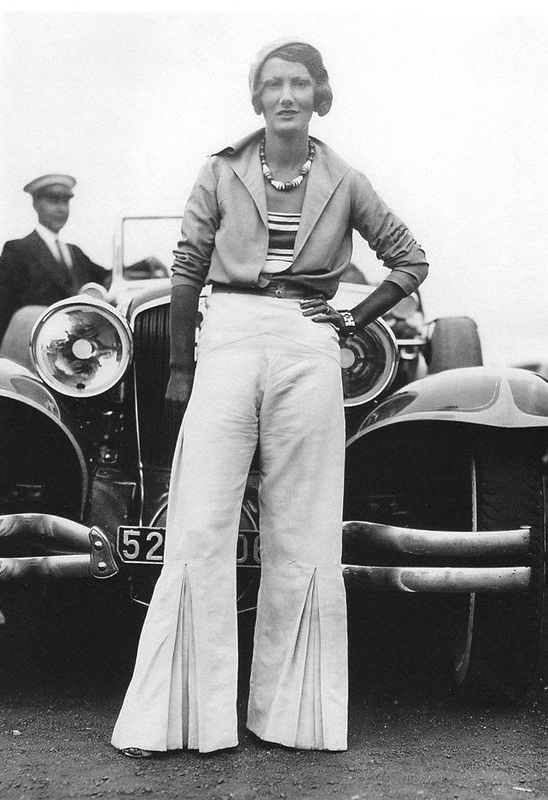 It was the nineteen thirties when trousers began to be worn widely. 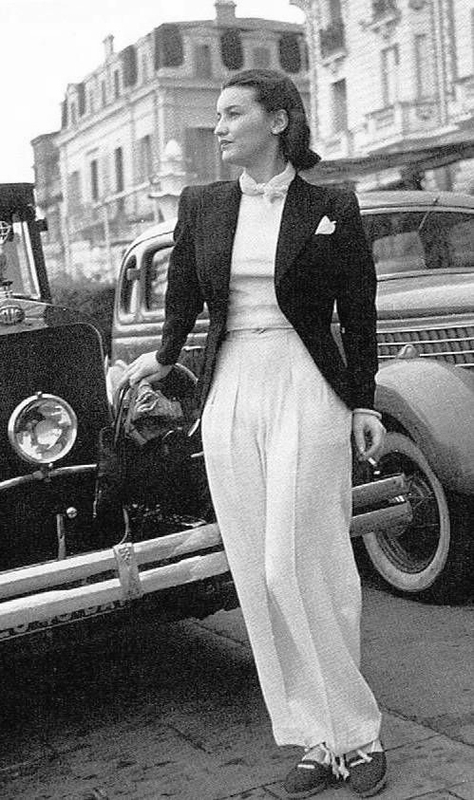 I remember my mother once telling me that, before my grandmother was married, she used to dress like “Joan Crawford,” in pants and flat shoes. My grandmother was a wiz a sewing. My grandfather, however, didn’t like women in masculine clothes and made her stop dressing like that. 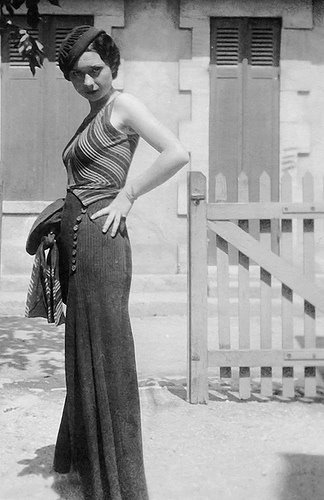 Here, we can see several of the characteristics of women’s trousers in the thirties, the wide legs, the generally loose fit, the “drop front” with two rows of buttons. It is also paired with a striped shirt and she seems to be holding a beret. 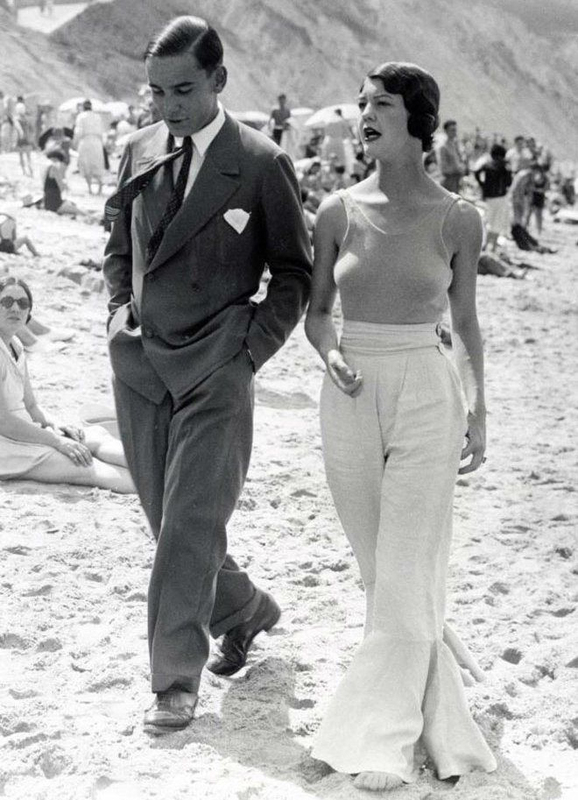 Trousers for women were becoming acceptable in active or sporty situations and were sometimes called “beach pyjamas.” According to “Witness to Fashion,” the beach pyjamas were derived from the clothes worn by French sailors and the French and nautical references are no accident. 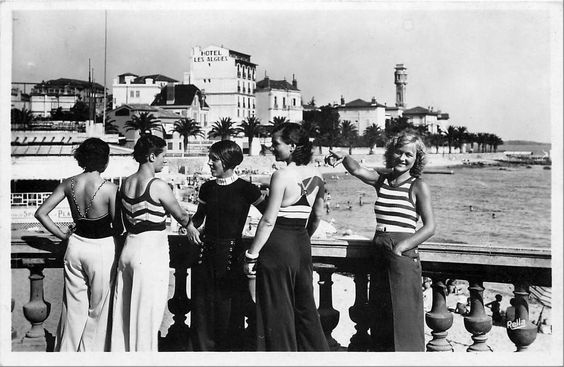 While looking through the photos I was able to find online, it seemed to me that the look was closely associated with the Côte d’Azure and was often pair with surprisingly skimpy tops. One thing that struck me and seemed to contradict our stereotypes of women in earlier ears, was the lack of bras. The natural shape of breasts is unmistakable. It probably doesn’t need to be pointed out the the waist of the pants falls at the natural waistline. 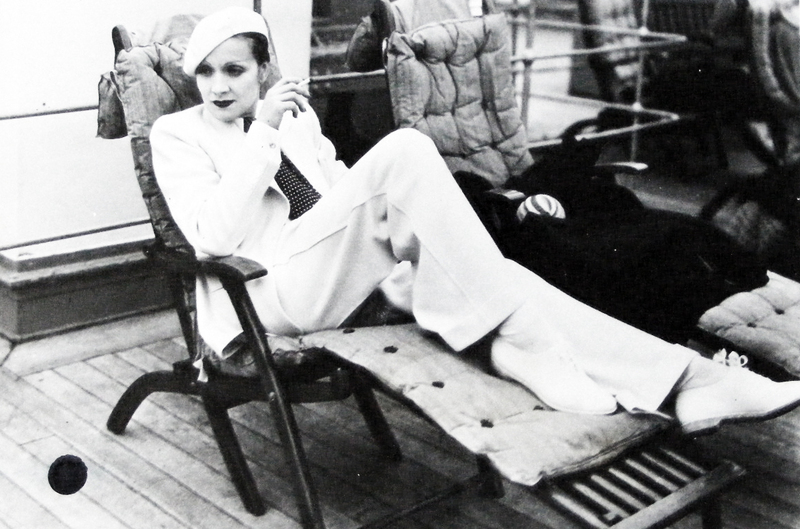 and, of course, my own personal “style icon,” Marlene Dietrich. Thanks. You have a fascinating blog.